A stranger arriving to town is poised to quell the town's long-standing feud, but it soon becomes apparent he has his own vendetta to resolve. "The Last Thakur" is an intense contemporary Western retold in a Bangladeshi setting by award-winning young British-Bengali filmmaker Sadik Ahmed. The film features leading Bangladeshi TV and theatre actors in a story of passion, jealousy and revenge. A fully functioning town and market place, reminiscent of the ghost towns of the Wild West, is populated by local characters, market stallholders and street orphans. The fields beyond are coloured with water buffalo, monkeys and crows. 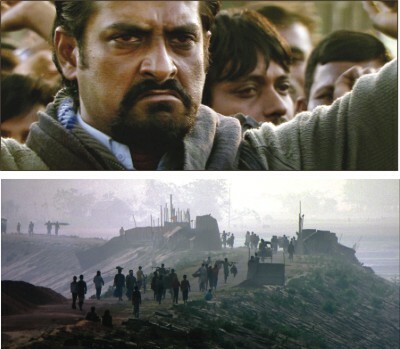 "The Last Thakur," running in UK theatres now, is a follow-up to Sadik Ahmed's short film "Tanju Miah," which was the official selection in Toronto and Sundance, and won Kodak Cinematography, Royal Television Society and Grierson awards. The film has been shot on High Definition cameras.